It isn’t the McConaissance but for Ottawa fans, it might be even more important. After a massive trade in the summer of 2013 that saw Bobby Ryan come to Ottawa on the day Daniel Alfredsson left, expectations were sky-high for the 26-year-old winger. Taken second overall by the Anaheim Ducks in the 2005 NHL entry draft behind some guy named Sidney Crosby, Ryan had scored 30 or more goals in four of his first five NHL seasons. While only managing a pedestrian 11 goals in the lockout-shortened season, Ottawa fans rightly believed that for the first time since Danny Heatley skated for Ottawa, the Senators had a genuine scoring superstar. Except things didn’t go as planned for Bobby Ryan in his first two seasons in the national capital. In his first season he only managed to score 23 goals and post 48 points, both career lows for an 82 game season. His season also ended prematurely after 70 games due to hernia surgery. As a further kick in the teeth, Ryan was also very publicly left off the 2014 USA Olympic team because of perceived character flaws. After a summer to recover, fans hoped that 2014-2015 would mark a return to form for Ryan. Except early in the season he suffered a broken hand which seemed to affect him until December. Only after Paul Maclean was replaced by Dave Cameron did Ryan start to find his game. However, even then, he went through the longest scoring slump of his career – 16 games – and didn’t even manage to score 20 goals. Yet, there were some positives, his 36 assists were the second most of his career and his playmaking ability clearly contributed to breakout years from regular line-mates Mike Hoffman and Mika Zibanejad. But with a new seven-year, $50.75 million extension starting at the beginning of the 2015-16 season, Ryan was going to come under even more pressure to score. 18 goals just wasn’t going to cut it. Bobby Ryan is able to use his strength to win the puck and then has his head up and is able to spot Mike Hoffman. Ryan, then immediately heads towards the net while Hoffman puts the puck back to the point. With Mike Zibanejad screening him, Henrik Lundqvist can’t control the rebound and Ryan is able to fight off his man and put the puck into the open net. One to nothing Ottawa. The goal, while not the prettiest one Ryan has scored in an Ottawa uniform, demonstrates two of the main reasons for Ryan’s resurgence: his strong playmaking skills and a renewed commitment to playing in the dirty areas of the offensive zone. There was never any question that Ryan had soft hands, a fantastic shot and great goal scoring instincts. His 31 goal rookie season demonstrated that. However, during his time in Anaheim, he was primarily viewed as a sniper. When Ottawa acquired Ryan many assumed that he would simply slot in beside Jason Spezza as the heir apparent to Danny Heatley. As Ottawa fans know, that isn’t what happened. 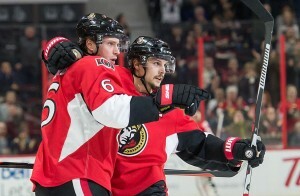 Beginning last season, Ryan developed tremendous chemistry with Mike Hoffman and Mike Zibanejad. Except, instead of being the finisher, Ryan had turned provider. As you can see in the video above, as soon as Ryan wins possession of the puck his head is up and he is looking for an option, which he finds in Hoffman. Because of his strength on the puck, Ryan can protect the puck and create time and space for himself, drawing in defenders in and allowing his line-mates to find the open ice. When Hoffman or Zibanejad manage to get open, Ryan has the hands to finesse a pass through to them. It isn’t clear whether this change in Ryan’s game is a conscious one or not, or whether it merely is one born out of the practical fact of not having an elite playmaker like Ryan Getzlaf or Saku Koivu feeding him the puck. The other major reason for the Ryanaissance is a more purposeful change in how he plays. As both pundits and Ryan himself have observed, last season he was shooting mostly from the perimeter. While still generating shots at an elite rate, Ryan was scoring on a lot fewer of those shots as they weren’t coming from the danger areas of the ice. However, as his goal on Sunday afternoon demonstrates, this season Ryan is willing to go to the front of the net, take punishment and score goals. The stats bear this out. This season the average distance from the net that Ryan is shooting is 30 feet. That is almost two feet closer than last season; a very basic indication that Ryan is indeed getting to the dirty areas of the ice. Barring an unforeseen injury this year will be Ryan’s best in Ottawa. Certainly the way he is playing now easily justifies his $7.25 million per year cap hit. His 2.98 points per sixty minutes ranks him second among right wingers behind only Patrick Kane and his 42 points is good for 16th in the league. Ryan is also only 28 and while his numbers will start to decline, they should only do so slowly at first. His contract also expires when he turns 35, so Ottawa won’t be locked in to paying him into his late 30s, years when players’ production often drops off a cliff. What is particularly encouraging about Ryan though is his return to form this year. He was able to identify flaws in his game and make necessary adjustments to ensure he maintained his status as an elite winger in the NHL. If Ryan has the self-awareness to do that at age 28, he should be set for a long time. He might even score some other kids a puppy or two!